This issue of Doctor Who Adventures is so packed with action that it’s practically bouncing around! They’ve got the Doctor’s best sporty moments, a huge Canton’s Code mega-quiz, an awesome Auton behind the scenes. Plus, there are more monster texts, some hilarious Who lookalikes and two brilliant comics! 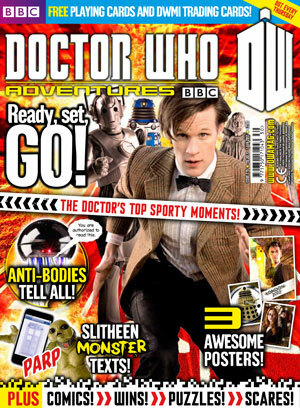 This issue comes with a cool pack of Doctor Who playing cards and a pack of Doctor Who monster Invasion trading cards. Priced at it's usual RRP.